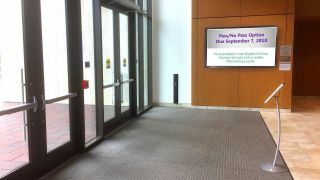 As universities and higher education institutions seek to expand the horizons of their digital signage networks, many have discovered the campus-wide communications and media limitations of their first-generation systems. This was the case at Santa Clara University in Northern California, which upgraded to Navori’s QL digital signage engine before the Fall 2018 quarter. The upgrade has at once simplified operations and enabled new services and opportunities across the 80-screen network. Navori QL is a cloud or on-premise solution—Santa Clara opted for the centralized cloud deployment—that offers a flexible, multi-seat architecture for campus-wide networks. That multi-seat flexibility was a key deciding factor for the 24 content managers contributing to the 80-screen network, which has a presence in almost every building on campus. The high-quality reproduction of 4K graphics and other visual content, along with general ease of use, competitive pricing, and rich data integration, further set Navori apart from other vendors competing for the project. Mills often handles the editing and dissemination of content contributed from the 24 managers. While much of this content is distributed campus-wide, specialized slides are often created for certain departments, including the School of Engineering. Nicole Morales, director of digital media technologies for the School of Engineering, noted that Navori QL’s ease of use and richer data capabilities have made an enormous difference throughout the department. According to Santa Clara's Ali Reimer, Navori QL has improved visual quality across the network for both 4K and 1080p content. Ali Reimer, assistant director of marketing and communications for the Leavey School of Business, manages the digital screens that live within Lucas Hall. She noted that the screens have become a central communications platform to promote events and course information to business students and visitors, and promote faculty members and their research projects among other initiatives. Reimer added that Navori QL has also improved visual quality across the network for both 4K and 1080p content. She has been exploring the many different template options for portrait and landscape displays in her department, and been gradually incorporating more tickers to develop a more well-rounded experience. Moving forward, Mills expects to extend the network to new buildings currently being planned or that are already under construction. He also is working with Navori to integrate the campus emergency notification system with the digital signage network, using the Common Alerting Protocol (CAP). Once live, the integration will provide a digital format to disseminate emergency messages simultaneously over the Navori QL network and other communications systems around campus.